The situation concerning the unrecognized republic of Nagorno-Karabakh (NKR) has escalated to the point where today, in rare unison, Washington, Moscow and Brussels demanded an immediate halt to any action that would lead to a further increase in the tensions and called for parties to come to the negotiating table. Negotiations may be held in Sochi on August 8-9. The OSCE Minsk Group (MG) mediators, supervising the negotiation process, are working towards organizing a meeting involving the presidents of Azerbaijan and Armenia, Mr. Ilham Aliyev and Serzh Sargsyan. Whether or not such a meeting take places remains an open question; both in Baku and Yerevan the response to such a proposed meeting has been cold and it is more often said that meeting for the sake of meeting has lost all meaning. Negotiations at the highest level are a worthy exercise only when there is something to negotiate. The parties remain far apart on the issues and a final resolution to the Karabakh problem the parties view as diametrically different; Azerbaijan would like to see a resolution whereby its jurisdiction is restored, but Armenia would like for the independence of NKR to be recognized, as does the Nagorno-Karabakh Republic. David Babayan, the head of the Analytical Service to the president of the NKR, commented to a NEO correspondent, that the absence of Stepanakert at the negotiating table was an impediment to any progress in the negotiations. “In the meantime, the return of Nagorno-Karabakh to the negotiating table is the only means by which this conflict can be resolved”, said Babayan and further referenced the recent escalation of the conflicting parties on the frontline as biggest since the signing of the ceasefire agreement. The parties have demonstrated a readiness to deploy full-scale military action. In skirmishes at the end of last week there was an exchange of artillery fire. Azerbaijan has begun to move up to the frontline heavy equipment and have committed Azerbaijani aircraft to fly over the positions. 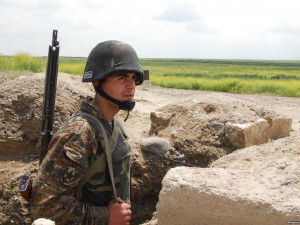 A spokesman for the Azerbaijan Ministry of Defence, Vagif Dergahli, said that Azerbaijan is not obliged to report to anyone as to where troops are deployed and the reasons for such deployment. From the Armenian side, redeployment in appreciable amounts was not needed. Nagorno-Karabakh has long been strongly defended in anticipation of an attack from the enemy. Nevertheless, the Ministry of Defense for Armenia, and later the NKR, made ​​an unequivocal appeal to the Azerbaijani side not to play with fire. The head of the Baku Political Scientists Club, “South Caucasus”, Ilgar Velizade, commented to a correspondent of NEO, that “an escalation in the conflict zone could be expected at any moment”. “Thenegotiationprocessisatastalemate. The opposing sides are rapidly arming and the ceasefire has been violated more times in the first seven months of this year than in all of last year combined. “The time when you could adopt half-hearted solutions to resolve the conflict, in my opinion, has been lost. Today we must not talk about how to strengthen the ceasefire, but on the preparation for a resolution framework to the root problem of Karabakh”, Velizade said. He considers conversations regarding agreements for the creation of a so-called buffer zone around Nagorno-Karabakh in exchange for peace and the establishment of relations as not at all serious. “This is exactly the same half-hearted approach of which I spoke earlier”, said Velizade. The president of the Yerevan Center for Globalization and Regional Cooperation, Stepan Grigoryan, told a correspondent of NEO, that the main reason for Azerbaijan maintaining tension along the frontline of NKR, and actually on the Armenian-Azerbaijani border in the north-east, is the desire to constantly remind the international community of the unresolved problem of Nagorno-Karabakh. “It is obvious that in the context of Ukraine and Syria, the problem of NKR, from the perspective of the international community, doesn’t have such great importance and interest in a geopolitical sense. Therefore, Azerbaijan does not agree to the withdrawal of snipers and does not acquiesce to the status quo in the South Caucasus”, said Stepan Grigoryan. 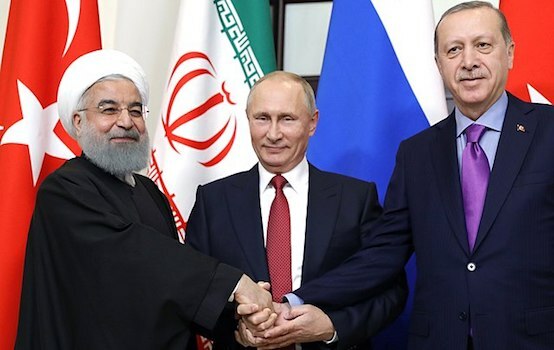 According to the political analyst, the significant scale of the violations to the truce over the past few days are due to several factors; “First, Russia has sold a considerable amount of the modern offensive weapons to Azerbaijan. Given the fact that Armenia together with Russia are members of the (ODKB) Organization of Collective Security, such steps by Russia will definitely generate different issues in Armenia, and at the same time, encourage Azerbaijan. The end result, the strategic partner of Armenia, having the largest military base in the region on Armenia territory, based on business interests, sells strategic weapons to Azerbaijan, which is in an actual state of war with Armenia. This could not do anything but motivate Azerbaijan on to some decisive action. The second and no less important, after taking into account the interests and concerns of Russia, Armenia refused to sign an agreement on September 3, 2013 for association with the E.U., leaving Armenia in a state of “limbo”. As it turns out, Armenia is not expected to be included within the Customs Union (Belarus and Kazakhstan have serious reservations regarding Armenia’s accession to the CU), and on May 29, 2014, Armenia was not accepted as one of the founding members of the Eurasian Economic Union (EAEC). That is say, as of today, Armenia is neither with Russia nor Europe. Of course they are aware of this in Baku and are increasing pressure on Yerevan by means of creating tension on the border”, remarked author Stepan Grigoryan. According to his words, it is necessary to take into account the fact that Azerbaijan to Russia is of particular importance in light of the potential entry into the EAEC; and even more so now considering that Ukraine has signed an agreement on association with the EU. They are also aware of this factor in Baku, since they understand that Moscow will not pressure Azerbaijan in the worsening situation with Armenia, since Russia still hopes that Azerbaijan will decide at some point to become integrated within the EAEC. The director for the Institute for War and Peace in Azerbaijan, Shahin Rzayev, agreeing with the aforementioned assessments of colleagues about the unprecedented scale violations of the truce, said that “it appears, between the parties, they are preparing … the next new agreement”. “By the end of this year or early next year, we should expect a breakthrough in the talks between the two leaders. In anticipation of this breakthrough, each side is attempting to strengthen its position,” said Rzayev. He suggests that the documents to be tabled by the presidents are almost ready. That’s why each party is attempting to create for themselves the most favorable negotiating position so that any concessions made at the negotiation table will be relatively painless. “If we accept the reports appearing in the press, an agreement has been achieved for the liberation by the Armenian side of five of the seven Azerbaijani districts surrounding Karabakh. What remains unresolved is the fate of two more regions”, said Shahin Rzayev. Rzayev, as did Grigoryan, did not rule out the connection between the events on the frontline in NKR and the issue of expansion of the EAEC. “Officially, of course, it is not spoken, but certainly Moscow is interested in Azerbaijan joining the Eurasian Economic Union. According to my own observations, the idea of joining the EAEC is not categorically unacceptable for Azerbaijani society if it will not affect their political sovereignty. But Azerbaijan must receive major concessions from Moscow in order to spur their interest in joining the organization. And most importantly, what we want is the restoration of the territorial integrity of Nagorno Karabakh. And moreover, a military solution to the problem does not serve the interests of the parties or the mediators”, said Rzayev. The head of the Analytical Service for the president of the NKR, David Babayan, called the suggestion for the creation of a buffer zone around the breakaway republic as “baseless information”. “And any talk regarding NKR as a bargaining chip in the process for the accession of Azerbaijan into the EAEC as mere speculation. It is not a realistic scenario. It is necessary to understand that a return to the past for Nagorno-Karabakh is not on the table and cannot be. This applies to the status of the republic, as well as to its borders. For us the most important thing is to ensure the security of NKR, said Babayan. Right now tensions are somewhat eased, but if war resumes, it will be life-and-death”. 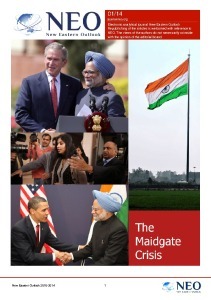 - In view of the on-going wars, and growing, can we talk about the beginning of World War III? - No. This is not the Third World War. Militaries are not yet prepared for it. This is the onset of a second Cold War. – Wars happen separate from one another and are local; most often they are random. They can be prevented for the most part, but good sense on the part of politicians is quite often poor. Yuriy Simonyan, columnist of Independent Newspaper, exclusively for the online magazine “New Eastern Outlook”.